Whoops, it’s happened again: Getaflix has been kidnapped, this time by a raiding band of Goths. 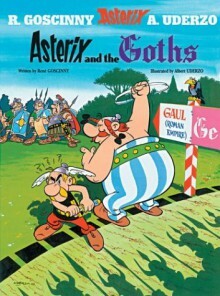 So it’s onward and into Germania for Asterix and Getaflix. But in the process of saving their druid, the two Gauls set off a whole series of tribal wars.